Bottleneck Gallery journeys back to Middle Earth today with Jonathan Burton’s epic officially licensed Lord of the Rings: The Fellowship of the Ring movie poster! 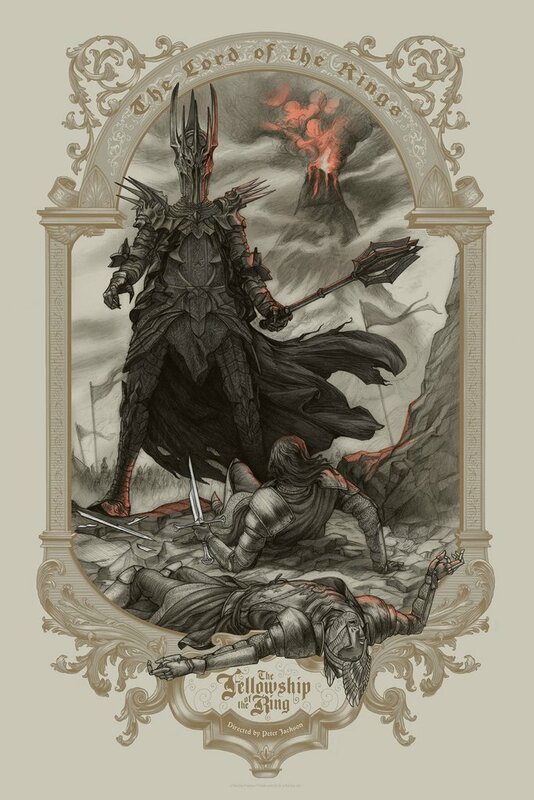 Burton’s The Fellowship of the Ring design is a sinister and cinematic piece, focusing on Sauron lording over the fallen heroes as Mount Doom rages in the background. As BNG explained, “We’re always excited to work with different artists to get their wildly different takes on films we love, and we think Jonathan is off to an incredible start with this first Lord of the Rings print!” The Blot can’t wait to see what he does with the rest of the franchise. The Fellowship of the Ring by Jonathan Burton is a 24”x36” hand numbered Lord of the Rings screen print. Limited to just 200 pieces, this new movie poster is available now at the Bottleneck Gallery online store for $50.